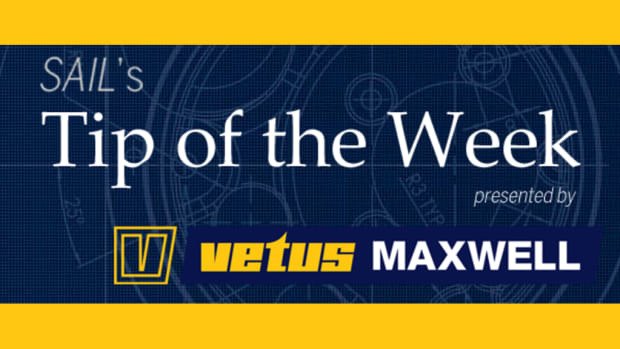 In this first part of a two-part series on light-air downwind sails, Rupert Holmes looks at the different types of Code 0’s and A-sails now available to cruisers. To learn more about how to handle these kinds of sails. Read part 2 here. The list of potential downwind sails for use in light airs is mindboggling, and it only seems to grow every year.  The question then becomes: what does a typical cruising yacht actually need to make reasonable speed in light air without resorting to the engine? A lightweight reaching or running sail will often propel you 50 percent faster than just the main and headsail. For example, if you are making 3.5 knots under jib and main alone, you could be making 5 knots with a light-air sail. This cuts way back on engine use, whether daysailing or on passage. Spinnakers of any variety often conjure up images of over-extended racing crews getting in a mess, but it doesn’t have to be that way. This is especially true because the biggest benefits of specialized downwind and reaching sails on cruising yachts come in lighter airs, when control is easy and the sail provides that big boost to speed. Therefore, symmetrical spinnakers, and asymmetric spinnakers and Code 0’s, both of which fall under the catch-all “genneker” category (see sidebar “Decoding the Terms”), all potentially have their place. Until a couple of decades ago, almost every yacht had a sailplan with a large overlapping genoa. And while these tend to be inefficient when partially furled for sailing upwind in a stiff breeze, they make reasonable reaching sails and can also be poled out to good effect when sailing dead downwind in stronger winds. More recently, however, fashion has turned in favor of small non-overlapping blade jibs, often self-tacking. These are much easier to handle, especially when short-tacking shorthanded, and are often significantly more efficient upwind, particularly in a blow. However, they quickly lose efficiency as the boat bears away from the wind. The reason for this is that, because they are so high aspect in their cut, as soon as the sheet is eased twist rapidly increases to the point where the top of the sail is wildly undersheeted, even if the lower part is still over-trimmed. This can be solved to some extent when close-reaching with an outboard lead for the jib sheet, but even then it won’t help once the apparent wind is well aft of the beam. 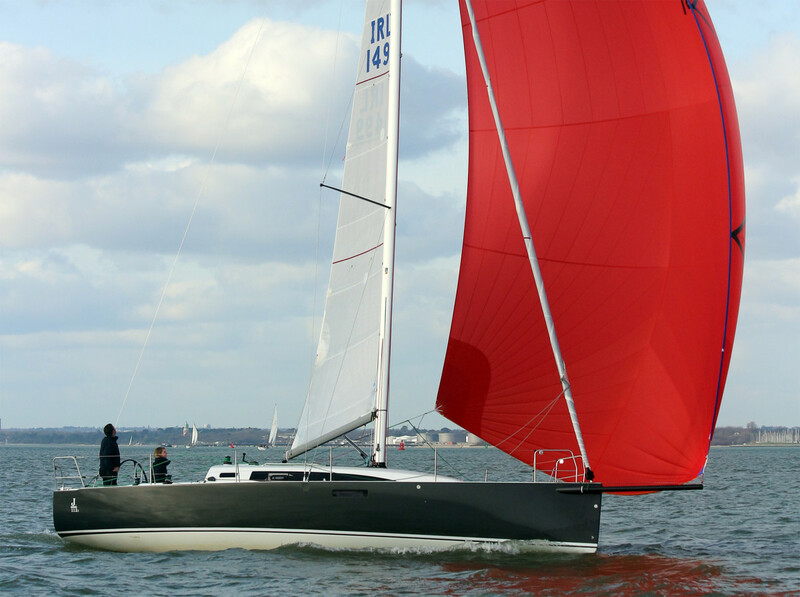 Some designs for long-distance cruising combine the best of both worlds by carrying a large overlapping genoa on the headstay, plus a blade jib on an inner Solent stay, both handled with furling gear. However, aboard a smaller cruiser this kind of double-headsail arrangement is not always practical and adds a fair bit of complexity. Note that when talking about downwind sails there is a very real distinction between those configured for reaching and running. No single sail can do both efficiently. (An exception is aboard those high-performance boats that are so fast the apparent wind is always forward of the beam.) Conventional symmetric spinnakers flown from a pole, for example, will happily sail with the wind dead aft but will struggle in all but the most skilled hands with apparent wind angles much forward of around 100 degrees. True, with the apparent wind forward of abeam you may still be able to keep the sail full. But its shape will be horribly inefficient, contributing more energy to making the boat heel than to driving it forward. 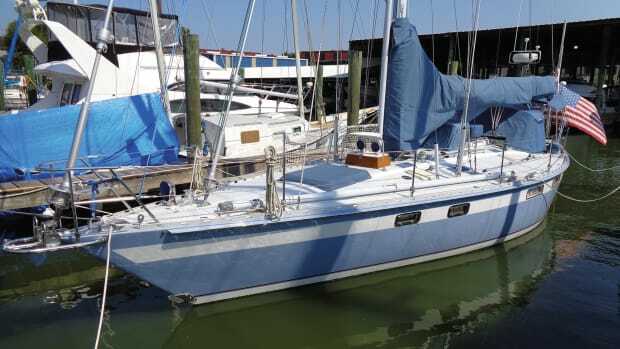 It’s also important to recognize there’s no reason why you should keep exactly the same sailplan aboard your boat as when it was built. Sail design, materials and trends—both good and bad—all change over the years, and there’s no reason not to take advantage of whatever advances have been made since your boat left the factory. Just because your boat carried a convention symmetrical spinnaker all through the 1980s, doesn’t mean it should necessarily do so now. 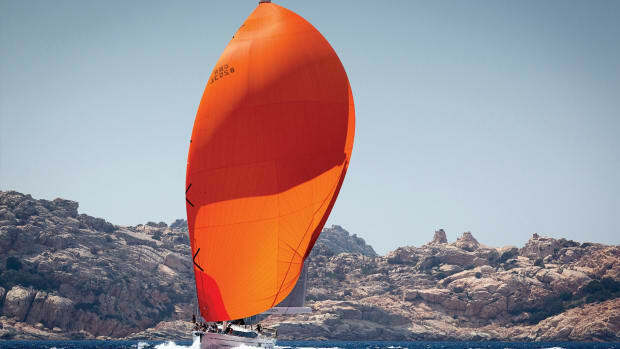 Code 0’s are a popular modern close-reaching sail, and for good reason. A kind of cross between a genoa and an asymmetric spinnaker, Code 0’s tend to be cut with a flat shape that allows you to sail relatively close to the apparent wind. They are also built with a torque line in the luff and deployed using a continuous-line furler making them easy to use. As such, they have revolutionized sail handling. Code 0’s can be especially effective in light airs, when they have the potential to help even displacement yachts sail at speeds close to the true wind speed. They are made of a very light fabric, so the lightest of zephyrs will fill the sail. In addition, they provide significantly more sail area than even the largest overlapping genoas and are cut with a shape that packs much more power relative to the sail area. As the breeze increases Code 0’s can also be used at up to a 90-degree true-wind angle (TWA) in 10 knots or more of wind. In even stronger airs, a Code 0 can be carried with the TWA as far aft as 130 degrees, although if you bear away much farther from the wind than that the sail will start to be blanketed by the mainsail. As a side note, because a Code 0 is deployed and furled using an anti-torsion rope sewn into the luff in concernt with a continuous-line furler, it’s impossible to wrap a Code 0 either around the headstay or into a wineglass, as is the case with a conventional symmetrical spinnaker or A-sail. Although a few sailmakers produce Code 0’s in a heavy nylon of around 2.2 oz, this tends to only be viable as a budget choice on smaller boats. The problem here is that when the sail is powered up, the material will stretch so much the sail shape becomes significantly distorted. The more widely used option is a lightweight laminate material, typically equivalent to a weight of 1.5 to 2.2 oz., which will maintain its shape across a wide range of wind speeds. A very lightweight Dacron may also work as a budget alternative as it will tend to hold a better shape than nylon. This nylon A-sail is doing a great job of keeping the boat moving when the crew might otherwise be tempted to fire up the auxiliary (left); Asymmetric sails like this one are given plenty of luff to help rotate them out away from the main (middle); Old-school “cruising chutes” still have a place aboard smaller, slower cruisers (right). Although they were slower to be adopted by cruising yachts, asymmetric spinnakers, or A-sails, have been with us for more than three decades—one of the first popular production yachts to be specifically designed for asymmetrics, the J/105, was launched in 1991. Over time A-sail shapes, particularly for running at deep downwind angles, have also changed considerably, with sailmakers now able to produce more efficient and easily trimmed asymmetric spinnakers that sail almost as low as traditional symmetric sails in flat water, given an attentive crew. To achieve this the sail needs to be cut as a true deep running sail (often called an A2), with a pronounced curve to the luff that enables the sail to project to windward of the forestay and therefore to windward of the mainsail’s wind shadow; although even then and at the best of times, A-sails don’t really work at a TWA of greater than around 160 degrees in flat water. 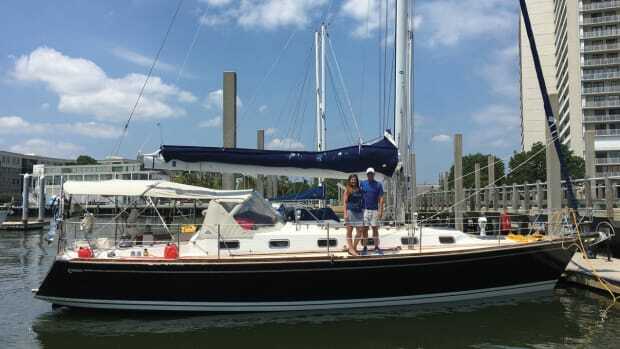 Of course, there are also still plenty of cruising boats out there carrying symmetrical spinnakers, for the simple reason that these classic sails remain the best option on many cruising yachts for sailing anywhere near to dead downwind, providing the boom is secured with a preventer when appropriate. This is especially true aboard many smaller, slower cruising yachts (boats under 36-38ft) in 8-15 knots of breeze, a situation in which they are likely to make their best downwind VMG sailing directly before the wind. Therefore, if you already have one in your inventory or can find a secondhand sail of the right size—maybe an old “cruising chute,” with a flat-cut shape and dowsing sock for easy handling—this may still be your best choice. That said, symmetrical kites are less likely to be bought brand-new these days for a number of reasons, including the aforementioned improvements in the shape of downwind-optimised asymmetric. In addition, the growing size and speed potential of today’s cruisers means they will actually make their best downwind VMG in light and moderate conditions by sailing a zig-zig course, gybing back and forth on a series of reaches to maximize their apparent wind speed and boatspeed. After that, as the true windspeed rises into the upper teens you can make good speed dead downwind by simply poling out the jib. As with asymmetric, not all symmetric are created equal. A sail designed for running, for example, tends to have broad shoulders to maximize area and a deep shape, again to help rotate it out away from the main. Before the advent of A3 asymmetrics, many racing yachts also carried smaller, lightweight, symmetrical “reaching spinnakers” with a flatter cut, to complement their downwind kites. In either case, if you happen to have one of these—or can pick one up used—it can still be effectively employed in apparent wind strengths of 10 knots or less. 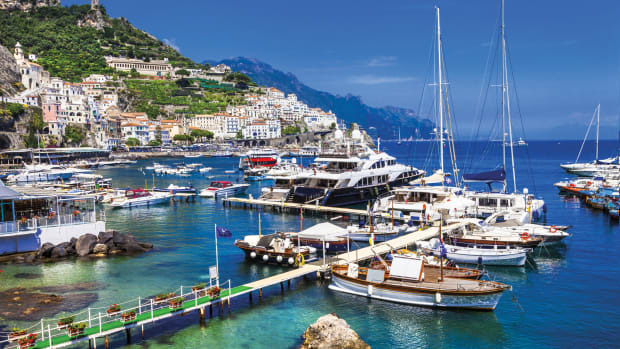 As an added benefit, while most of these are now old sails, many have not seen much wear and can be quite useful aboard a budget-conscious cruising yacht. It’s also nice gaining spinnaker-handling practice using a sail not worth thousands of dollars! With regard to materials, for sails other than Code 0’s, ripstop nylon remains universally the cloth of choice, usually in 0.75 and 1.5-oz. weights (although 0.9 oz. 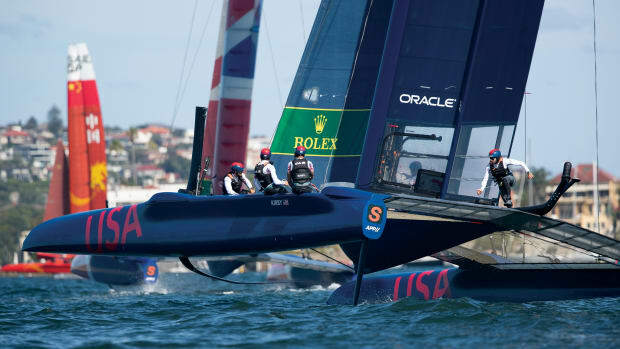 is sometimes used), while optimized light-airs race sails may be as little as 0.5 oz. When choosing the weight of cloth there are two key factors that have to be balanced—ease of filling the sail in light airs and the sail’s longevity. 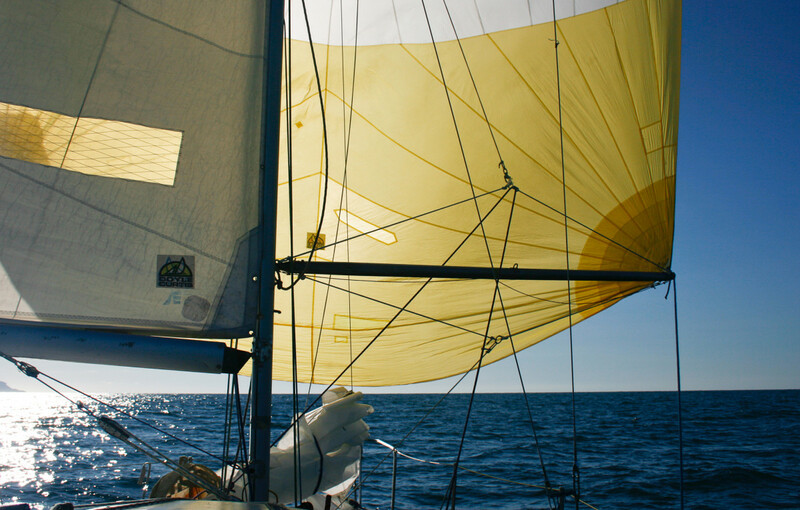 Unlike racers, cruisers don’t want to have to replace a spinnaker every few years, which suggests to a heavier cloth, although this can be counterproductive if the sail can’t easily be filled. On a raceboat, for example, I like to have a heavy-duty 1.5-oz. sail in the inventory that can be used in up to 30 knots of true wind. However, given that cruising boats are most likely to use poled-out headsails to get downwind in anything much above 15 knots, their spinnakers do not have to be so bulletproof. My cruising boat, therefore, has a 0.75-oz. symmetrical kite for medium winds, plus a 0.5-oz. asymmetric for very light airs. That sail, which is now quite elderly, is dropped before the apparent wind reaches 10 knots. 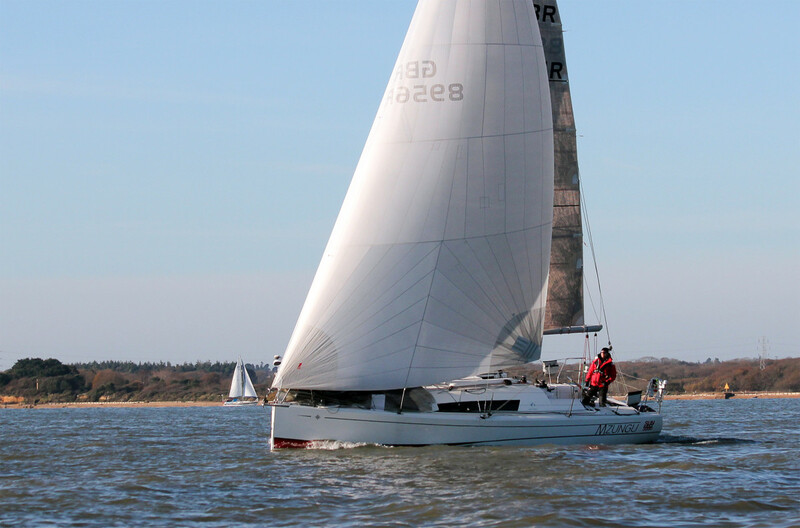 In the past raceboats would set a net in the foretriangle to prevent the spinnaker wrapping around the forestay, but this solution has a big drawback—it’s a lot of hassle to set up. 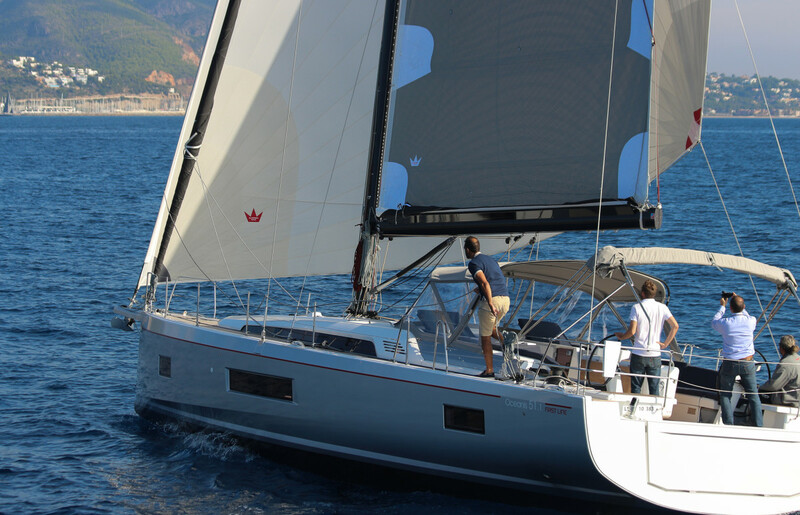 The easy alternative when cruising is to unroll around 30-60 percent of the luff length of the headsail. This won’t interfere too much with the airflow over the kite, but creates a physical barrier to prevent the sail wrapping around the headstay. Of course, the sail can still form an hourglass, but if it’s not also wrapped around the forestay this is not a disaster, as the kite can easily be dropped and repacked if necessary. A variety of terms is used for downwind sails, though it has to be said that most are used aboard raceboats. In addition to the Code 0, you may have heard of an A1, A2, A3, A4 and even an A5 or A6. The A simply signifies it’s an asymmetric sail, while odd numbers are used for reaching-oriented sails, and even numbers are for sails designed for downwind use. The higher the number, the stronger the wind the sail is designed and built for. Similarly, symmetric spinnakers are often designated S1, S2, S4 or S5. 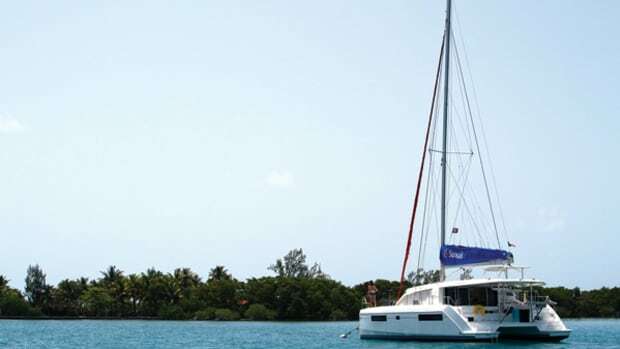 Terms such as gennakers, screechers (aboard multihulls) and reachers may also be heard. These are often applied generically, and the sails themselves may differ between different styles of boat. Therefore, when speaking to sailmakers it’s usually best to ignore the terminology and simply describe your problem and what you want a new sail to do. That way they can design the sail you need, as well as advising of any pitfalls you may not have foreseen.